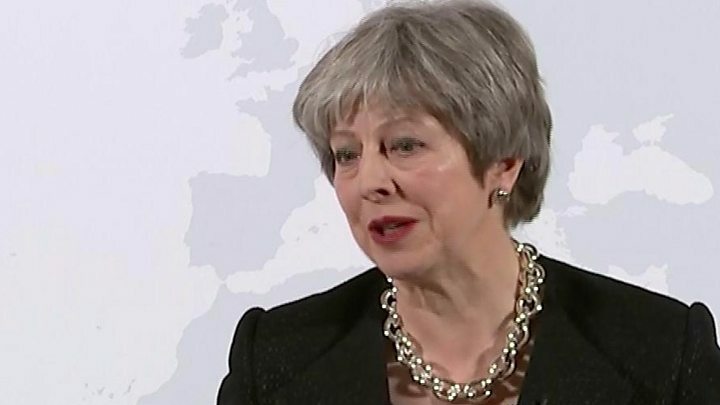 Media captionTheresa May's full Brexit speech where she said: "We chose to leave, we have a responsibility to help find a solution"
Theresa May has warned that "no-one will get everything they want" out of Brexit negotiations but she is confident a deal can be done. Setting out UK hopes for a future EU economic partnership, Mrs May warned both sides had to accept "hard facts". Single market access would be "less than it is now" and the UK would have to pay into some EU agencies. But she would not threaten to walk out of talks and in a message to the EU said: "Let's get on with it." The UK is due to leave the EU on 29 March 2019 but it wants a transition period lasting around two years after to smooth the way for business. Reality Check: What were the key lines in the speech? Laura Kuenssberg analysis: Were the facts hard enough? Mrs May said she was confident remaining differences over a draft EU legal agreement could be resolved, allowing trade talks to get under way. She said life would be different for the UK outside the EU's single market: "In certain ways, our access to each other's markets will be less than it is now." The UK could not expect to "enjoy all the benefits without all of the obligations" of membership. Another "hard fact" would be that the UK would still continue to be affected by EU law and some decisions of the European Court of Justice - such as the ECJ rules on whether EU agreements are legal - but she stressed that the "jurisdiction of the European Court of Justice in the UK must end". The UK may choose to remain "in step" with EU regulations in areas like state aid and competition, in order to get "good access" to markets, she said. The hard fact for the EU was that the UK would want its own bespoke trade deal, not an "off-the-shelf model". BBC political correspondent Alex Forsyth said "the real test will be whether this speech was enough to convince critics that Mrs May's ambition for Brexit is credible and achievable without alienating her own MPs". The speech contained a lot of detail on the kind of trading relationship Mrs May wants with the EU after Brexit. Banks located in the City of London will lose the right to trade across EU without country-by-country approval, so-called passporting. 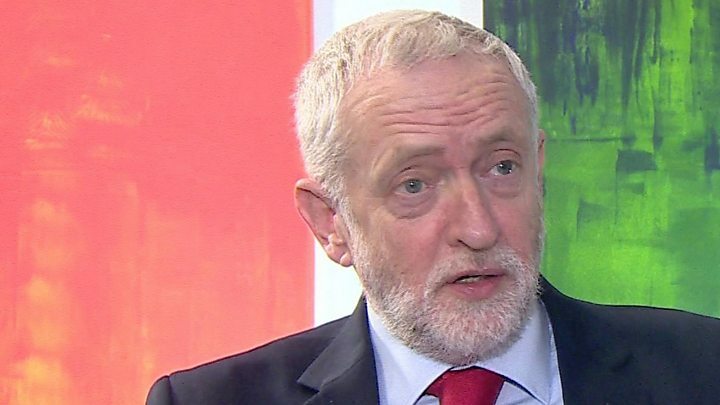 A new system will be brought in to allow "the same regulatory outcomes over time"
Keeping UK regulatory standards "as high as the EU's" to ensure smooth trade and while UK law may not be "identical" to EU law "it should achieve the same outcomes"
Media captionCorbyn: Speech offered "no clarity and no real sense of priorities"
Labour leader Jeremy Corbyn said: "After 20 wasted months, Theresa May has once again failed to bring real clarity to the negotiations - and worryingly, she admitted that her approach will reduce our access to European markets. "She read out a long list of problems but failed to provide solutions, particularly on the urgent question of preventing a hard border in Northern Ireland." Attacking Mrs May's suggestion the UK could stick closely to EU state aid rules, he added: "Theresa May's only clear priority today seemed to be to tie the UK permanently to EU rules which are used to drive privatisation and block support for British industry." A European civil servant said to me recently that Brexit was a fascinating intellectual exercise in rebuilding the existing elements of the UK/EU relationship but with Britain out of the club. Is that the same thing the prime minister proposed today, with the UK retaining associate membership of many of the EU's agencies, choosing to follow the rulings of the European Court of Justice where needed, trading freely and maintaining broadly similar economic and social models? One geeky-sounding proposal in particular demonstrates how ambitious - and potentially tricky - this could be. Mrs May said she wanted a bespoke deal for sharing data that went beyond the EU's usual tool of judging third countries' laws to be of equivalent status to Europe's. Yesterday Michel Barnier rejected this idea in advance. The EU chief negotiator tweeted some lukewarm praise today (lukewarm will be more than enough for Downing Street). But the EU's formal reaction will come next week the European Council President Donald Tusk publishes his first draft of guidelines for the phase of Brexit talks where all of this will be tackled. The prime minister called for a free trade agreement covering most sectors of the economy, going further than the deal signed between Canada and the EU but stopping short of Norway which is a member of the European Economic Area. "We need to strike a new balance. but we will not accept the rights of Canada and the obligations of Norway," she said. She again said a hard Irish border or a border between Northern Ireland and the rest of the UK would be "unacceptable" and said it was for the UK and EU to "work together" on a solution. She suggested this could be either a customs partnership, where the UK "mirrors" EU requirements on goods from around the world, or a streamlined customs arrangement, using technology and "trusted trader" schemes to do away with the need for customs checks. Amid criticism from the EU that the UK was attempting to "cherry-pick" the best parts of the bloc's rules, she said: "The fact is that every free trade agreement has varying market access depending on the respective interests of the countries involved. "If this is cherry-picking, then every trade arrangement is cherry-picking." The speech got a positive reaction from Brexit-backing cabinet ministers, with Foreign Secretary Boris Johnson tweeting: "We will remain extremely close to our EU friends and partners - but able to innovate, to set our own agenda, to make our own laws and to do ambitious free trade deals around the world." But pro-European Tory rebel Anna Soubry told the BBC that Leave voters would be right to question what was in it for them. "The Brexit we are heading towards is very, very different to the one we were promised," she said. The EU's chief Brexit negotiator Michel Barnier welcomed the speech, saying it provided "clarity" about the UK leaving the single market and customs union and a "recognition" that trade-offs will inform future talks on a deal. But the European Parliament's Brexit co-ordinator Guy Verhofstadt was not impressed. He said: "Theresa May needed to move beyond vague aspirations, we can only hope that serious proposals have been put in the post. While I welcome the call for a deep and special partnership, this cannot be achieved by putting a few extra cherries on the Brexit cake. " The DUP, whom Mrs May relies on for key Commons votes, welcomed Mrs May's "clear commitment that she will not countenance any new border being created in the Irish Sea between Northern Ireland and the rest of the United Kingdom". Leader Arlene Foster said she had "set forward the basis upon which it would be possible to move forward." Irish Prime Minister Leo Varadkar said he remained "concerned that some of the constraints of leaving the customs union and the single market are still not fully recognised". He added: "We will now need to see more detailed and realistic proposals from the UK. Brexit is due to happen in a little over 12 months, so time is short." Business group the CBI tweeted: "Excellent news if UK can stay in key agencies like EASA (European Aviation Safety Agency) - glad PM has focused on them." The TUC said there was "still a chasm between the prime minister's rhetoric and reality". Reality Check: What does the EU Brexit draft reveal?